Sandra Leyva, executive director of The Locals, pauses on a walk through Strack Farm during a farm tour. The Locals is a nonprofit organization dedicated to supporting and promoting local projects and events, as well as small local producers, including farmers, artists, musicians, techies and all types of creative people. Since it was founded in 2011, The Locals has had a strong involvement with the local food scene in Conway and has been involved in numerous projects to grow and strengthen the local food system in the region. The organization is dedicated to increasing the access and availability of local food in the community, and it achieves this in a variety of ways. The Locals has a history of supporting local farmers and food producers by facilitating activities that increase the community’s access to and awareness of local food. 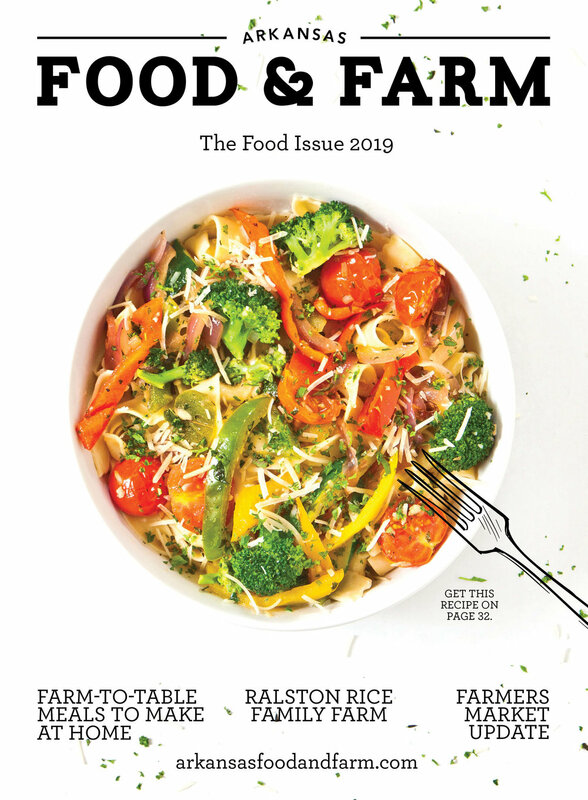 From farm tours and farm-to-table dinners, to pop-up marketplaces and food aggregation, the organization has developed multiple strategies to increase the visibility and consumer demand for local food. At least once a year, The Locals invites visitors on a tour around farms in Faulkner County in order to connect consumers with the people who produce their food. Here, visitors are treated to an explanation about the perennial flower and herb bed surrounding the Faulkner County Urban Farm sign. This year, The Locals began spearheading the Library and Garden District Initiative, an effort to establish a food innovation district in the neighborhood surrounding the Faulkner County Library. A food innovation district is a geographic concentration of food-oriented businesses, services, and community activities that promote a positive environment for local healthy food entrepreneurs, spur regional food system development, and increase access to local healthy food. Through a series of community meetings, the organization has begun to identify community needs and assets, create working groups and establish the boundaries of the proposed district. While this project is in its beginning stages, there has been a great response from the community. Among the ideas that have stood out during our meetings are: establishing a commercial kitchen that can be reserved by members of the community to make value-added products, establishing community gardens with individually managed plots and a tool library. Meetings take place the last Thursday of every month at the Faulkner County Library and everybody is welcome. In 2016, The Locals were awarded a Food Promotion Program grant that enabled them to outfit a small trailer with refrigeration features, allowing The Locals to function as a food hub. The hub is located at Bell Urban Farm in Conway. For the third consecutive year, The Locals is partnering with New South Produce Cooperative to receive and distribute community support agriculture (CSA) shares to customers in Conway. Through a USDA Local Food Promotion Program grant, The Locals established a small food hub (refrigerated storage unit) to aggregate and distribute local food, which now includes fresh fruits, vegetables, meat, cheese and even flowers. The food hub is located in Bell Urban Farm, where New South customers pick up a weekly or bi-weekly box with seasonal fruits and vegetables for the spring, summer and fall seasons. The CSA season starts in May, and using the code “BellUrbanFriends” customers can get $5 off their subscription. To sign up, visit newsouthcoop.com. The Locals recently piloted a food recovery program partnering with Harps Grocery Store. Over the course of four days, they recovered more than 450 pounds of fresh fruits and vegetables that were rerouted to fill bellies instead of the landfill. The organization hopes to establish this as a permanent program partnering with local schools and food pantries to distribute fresh healthy food to those in need. They are looking for volunteers to help pick up and drop off the food on Tuesdays and Fridays at 7:30 a.m.
Until the beginning of 2018, The Locals ran the Faulkner County Urban Farm Project, the educational garden located behind the Faulkner County Library. Originally conceived in 2010 as a gardening competition, The Locals soon adopted the project in 2011 in order to help it thrive and grow as a community effort. The garden’s mission was to teach people how to sustainably grow healthy food and relieve food insecurity by donating produce to volunteers and a local food pantry. From 2014 to 2017, The Locals successfully applied to become part of the Arkansas GardenCorps program and obtain full- and part-time service members to maintain and develop the garden and its programs. Thanks to this program, the Urban Farm Project was able to start a weekly children’s garden club, an annual seed swap event, a book club, a garden sketch hour and many more educational activities. The garden slowly started becoming an important part of the library’s educational resources, and beginning in 2018 the county approved funds to hire its first full-time library staff member to run the garden. With that, the Urban Farm Project transitioned to become an official part of the Faulkner County Library. The Locals continues to support this program through the Friends of the Garden subcommittee. For more information on the many ongoing projects of The Locals, visit thelocals.be.